This website was created for educational purposes and provides information about the snail, Patera perigrapta. This snail was formally known as Mesodon perigrapta and is often mistaken for a snail in the genus Mesodon when it's a juvenile (Burch, 1962). 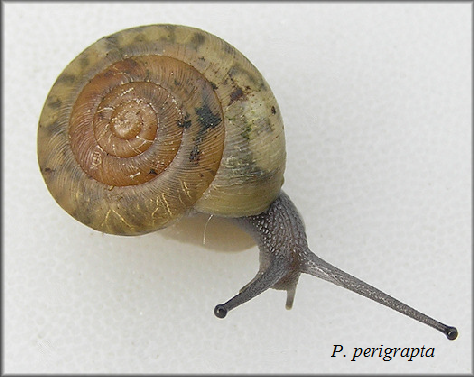 Within this webpage, you will be able to find information on different aspects of Patera perigrapta such as where this snail lives or what kind of food it eats. Throughout this webpage there are many different terms used to describe different parts and functions of snails. Many of the terms may be unfamiliar and can be found on the Facts Page.